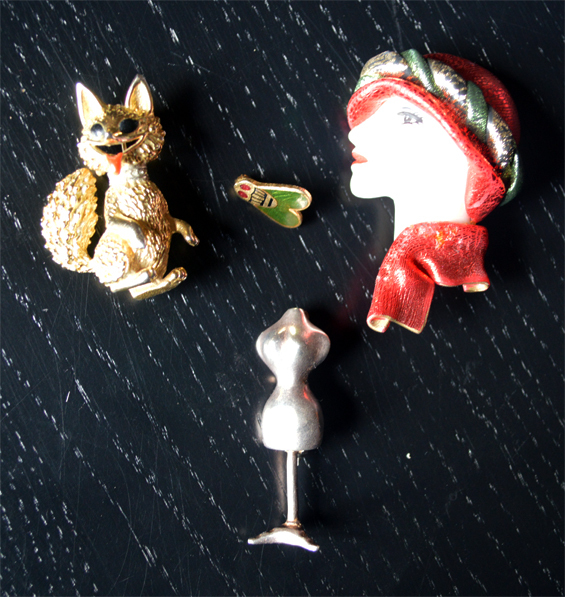 Treasured Posessions - A Selection of My (Mostly) Vintage Brooch Collection - Sugar, Darling? 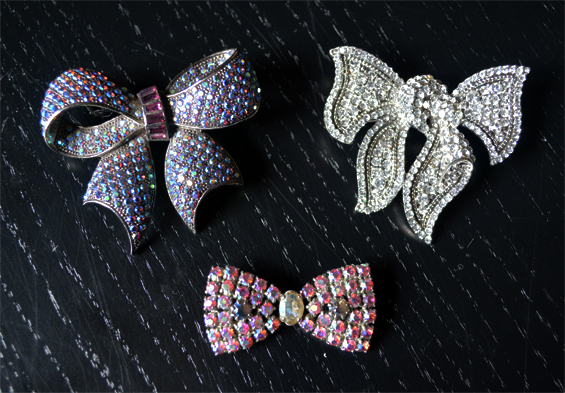 I adore brooches. They are the finishing touch to amost any outfit, can jazz up your ensemble if you feel you're looking a little dull and be used on so many things like hats, bags, stoles, scarves, jackets, cardigans... the possibilities are almost endless. Unfortunately they haven't really been in vogue for a good few years now and I think they deserve a revival, so I thought I'd share some of my favourites from my collection. Above are a selection of round pieces I have picked up at various vintage fairs and bric-a-brac markets. I find this shape to be the most versatile as you don't have to worry about pinning it on straight or if its shape will look odd on the piece you are adding it to. Unfortunately the white and green one is missing a little stone at the bottom and the star shaped one I am yet to wear as the pin is missing from the back, but this meant they only cost £1 each so I can't grumble too much! 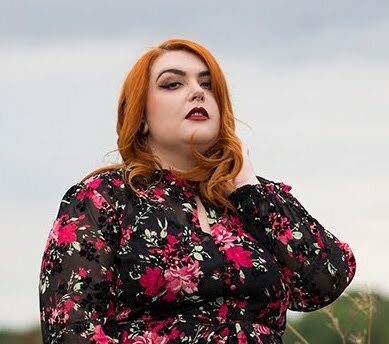 I have a big thing for bows (I have one tattooed on my wrist finishing my half sleeve) so naturally pretty ribbon brooches always catch my eye. All three were actually gifts to me and aren't terribly old, probably 1980's, but I still love them. They look so cute added to a black scarf or fur stole or jacket. Novelty brooches are also a favourite of mine - sorry this picture isn't so great I just couldn't get lighting right as they are all so shiny! The happy little fox is the brooch I probably wear the most and is one of my favourite vintage fair finds, I think I paid £4 for him. The flapper girl in the metallic red hat and scarf was an eBay purchase for about £6 I think. I am unsure where the little enamelled fly came from, it may even be something I've 'adopted' from my Mum and Dad and the little sterling silver dressform was from another fair. 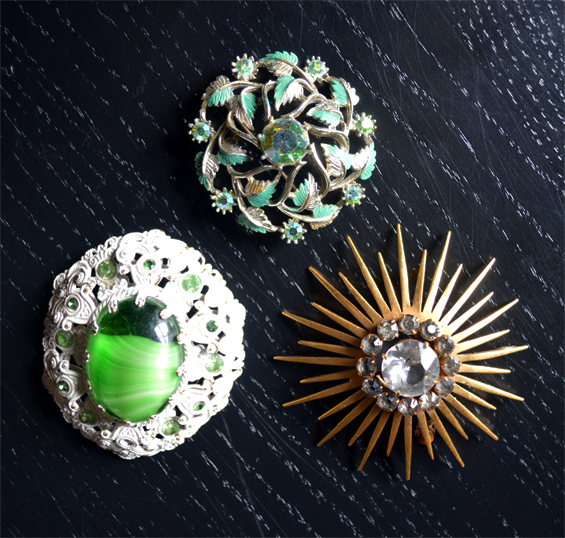 I have some modern brooches that I absolutely love too, mainly these four above. My parents bought me the colourful Butler & Wilson cross on my 18th birthday and I wear it an awful lot to add some spark to a mainly black outfit. I was given the Stray Cats guitar brooch at a concert when I was about 14 and the blue skully badge was a gift from an old tattooist friend of mine Chin when I helped him at the Gillingham Tattoo Convention a good few years ago. 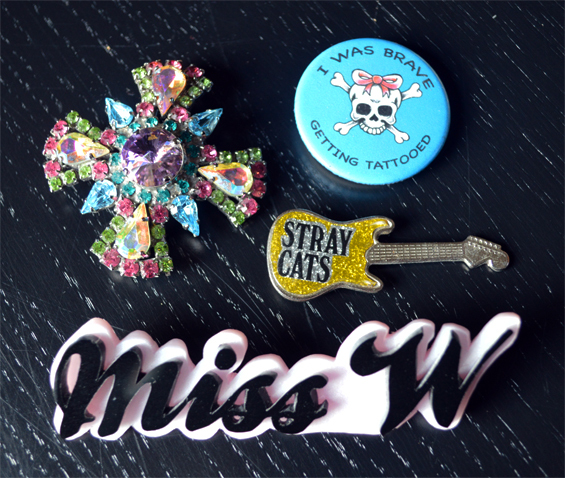 Last but not least is my Miss W badge that gorgeous Paula of Von Trash jewellery made me for wearing when out with my pop-up beauty parlour! It's a lovely pearlised pink and she hand cut it - no laser cutters here! If you're not able to get to many vintage fairs or markets but still want to add a special touch with a classy brooch there are some great companies producing them at the moment! 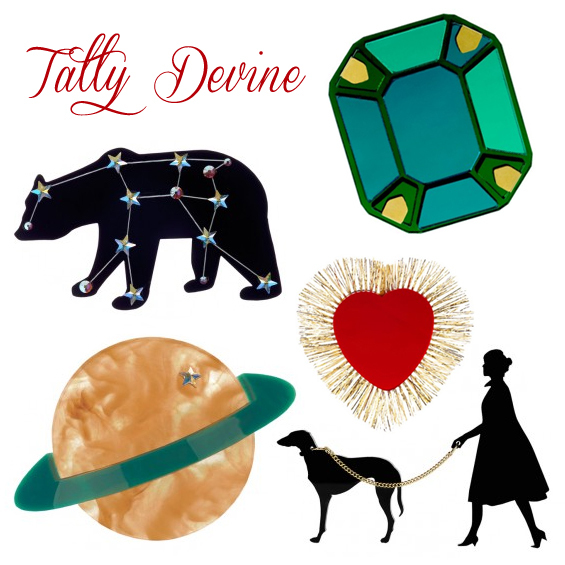 One of my favourites is Tatty Devine who make a wonderful range of mainly acrylic pieces inspired by both modern and classic designs. The above are my pic of the ones currently available on their website - unfortunately they are a bit out of my price range at the minute but a good few are going on my wish list for the future! 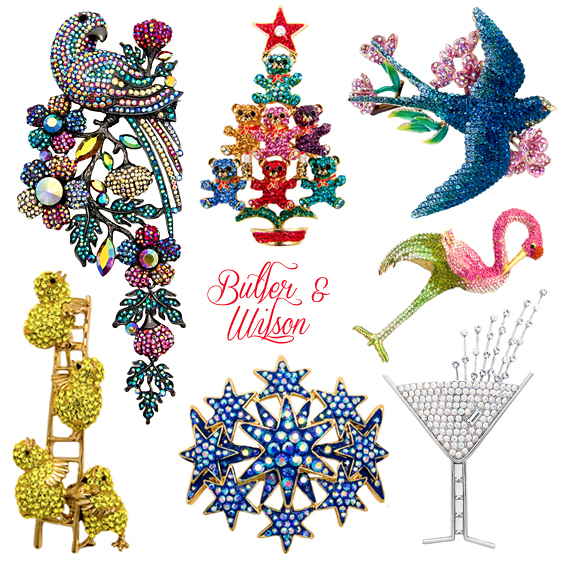 Butler & Wilson are one of my Mum and I's favourite jewellery designers. Mum has some gorgeous pieces by them including bracelets, necklaces and brooches. B&W pieces all super sparkly and feature both classic and more unusual designs; most being available in either bright crazy colours or more muted down tones. I really really really want that teddy bear tree to wear on Christmas day! Do you collect brooches too? If so I'd love to see your collection! There is a lady at herne hill market every sunday who has amazing vintage brooches...... she has a few 3D umbrella pins that I had to drag myself away from (I'd break them instantly!). Oh they sound fab! I watch out for delicate ones too, I know I'd bundle it the first time I tried to pin it on and end up with it in pieces!!! I collect marcasite brooches :) It started when my aunt/godmother gave me one that belonged to my great, great grandmother on my wedding day. It's been passed down through each generation and I was lucky enough to get it. I adore it. What a wonderful wedding gift and tradition! I do love when jewellery is passed down through the family. Marcasite brooches are so pretty I bet you have lots of envious friends! Fancy fuelling my book addiction? © Sugar, Darling?. Developed by ThemeShine.